Getting a serve right is paramount to maximising sales, generating profit and customer satisfaction. A drink perfectly served will build trust, ensures your consumers will be back for more and will get you positive recommendations. Using the correct glassware is very important. Not only should the glass hold the right amount of spirit, mixer, ice and garnish but the correct glass can contribute to the overall customer experience. Research shows if a drink looks better it tastes better! It is important that you use cool, dry glasses and handle the glass as little as possible – remember the top two thirds of the glass belong to the customer. Using clear, good quality ice is a key ingredient to creating perfectly served drinks. You can use different types of ice e.g. cubed or crushed for different serves and experiences. For long mixed drinks you should fill the glass with ice – the more ice you use the cooler the drink and the less dilution. The best way to ensure accuracy, consistency of drinks, reduce waste and showcase professionalism is by using a jigger to measure your spirit. For long mixed drinks you should pour the spirit over ice and a top tip is to pour in front of your customers with the label of the bottle facing them. Good, quality chilled mixers can create exciting flavours, textures and enhance the overall customer experience and boost sales. A good idea is to keep ahead of trends and stock new and emerging soft drink flavours, for example, ginger beers and flavoured tonics. These on-trend mixers allow you to offer your customer something different and make your venue stand out from the competition. Presentation can boost sales and give your venue a competitive edge. Quality garnish can add colour, flavour and make your serves extra appealing. An easy rule to go by is to use oranges for orange flavoured drinks, lemons for lemon flavoured drinks and limes for everything else. You could also experiment with peel and other garnishes such as berries and herbs. Ready to make the perfect serve? Take a look at our wide-ranging recipe database for some inspiration. Around a third of customers entering a bar are undecided about what they’re going to order, so your ability to impress and offer expert advice is to key to unlocking potential sales. A great way to upsell is within the brand using a menu, as most customers choose a premium version of their favourite brand before trying a new one and the menu is a great way to engage with customers. Find out more about the about the power of upselling and how it can boost sales in your venue with our upselling calculator. Signature serves are a great way to showcase your venue’s identity and help you stand out from the crowd. These serves can help spread positive word of mouth and by using local or different ingredients, it can offer your customers a different experience and boost sales. 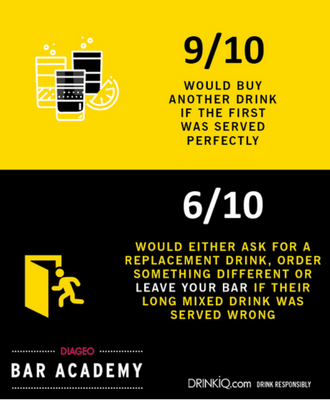 Are you making profitable serves and driving sales in your bar? Find out by using our profitability calculator. A great way to make your venue stand out is through the distinctive serves you offer for different occasions. Seasonal serves can give you that point of difference and an opportunity to engage customers and drive sales by satisfying their desire for treating themselves. Your seasonal drinks don’t have to be complicated and can be created by simply adding a garnish or extra ingredient. For example you could create summer outdoor serves with crushed ice, winter hot toddies or celebratory festive serves. Free downloadable menus, recipe cards and social media assets to use in your bar. Looking for a new recipe or need some inspiration? Take a look at our recipe database. Sign up and become a member of Diageo Bar Academy today and unlock the latest industry news, trends and tips to keep your bar knowledge up to speed!